Such a beautiful morning to wake up to: blue skies, warm temperatures and a gentle breeze. 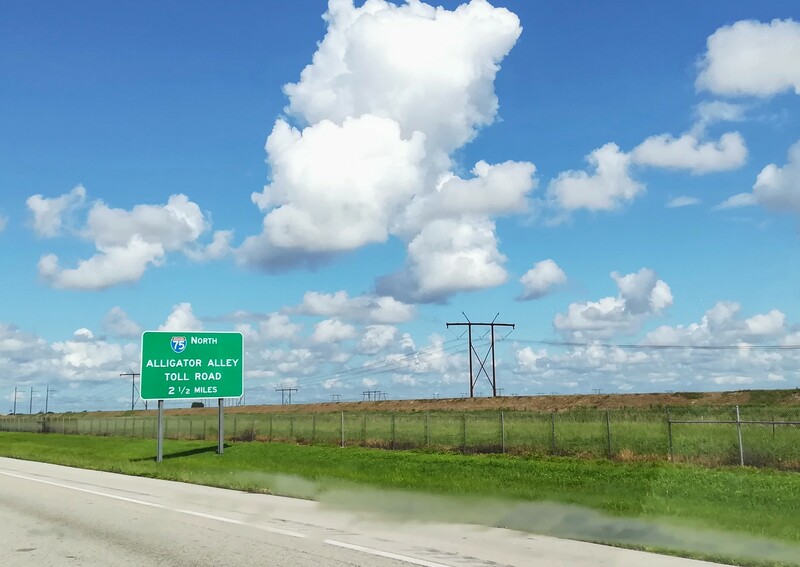 We decide to make the most of the ‘calm before the storm’, and take a drive along Alligator Alley, not the whole way to the Gulf Coast, but halfway. We are mindful of the decreasing amounts of fuel available in the garages, and have seen extremely long queues of cars waiting to fill up, or yellow tape around the pumps, proclaiming no fuel at all. We also went into Walmart to buy a few items, and predictably shelves were empty of water, bread, snacks and the like. 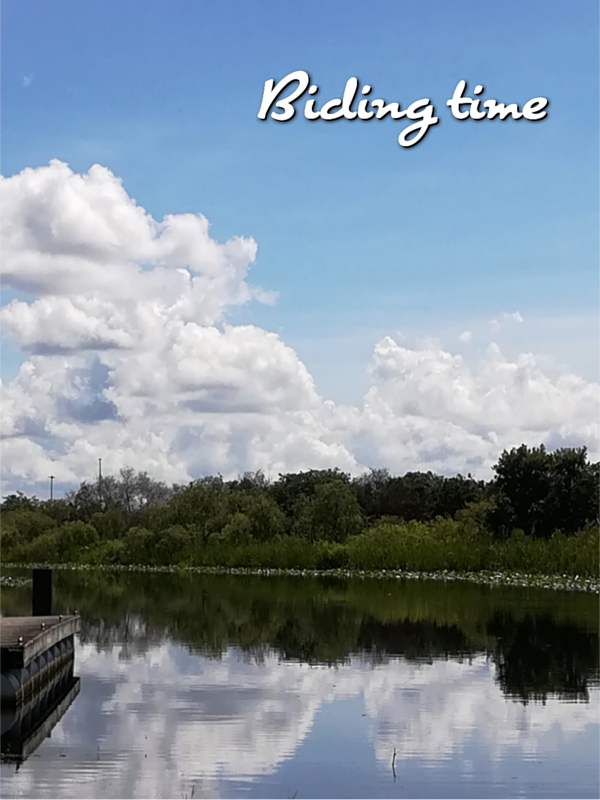 We now seem to be biding time, until Irma arrives, and then await to see the aftermath. Of course, we are watching, listening, taking note of the developing situation. Right now, at five thirty this afternoon, we are waiting to find out if we are to be forcibly evacuated from our hotel, here in North West Miami: it does not have toughened glass in the windows necessary to withstand the strong gusts. All surrounding hotel rooms have been taken, or the hotels closed. We are now looking at moving into a shelter……. I’m not sure how you would have coped with this, my darling. Probably not very well. 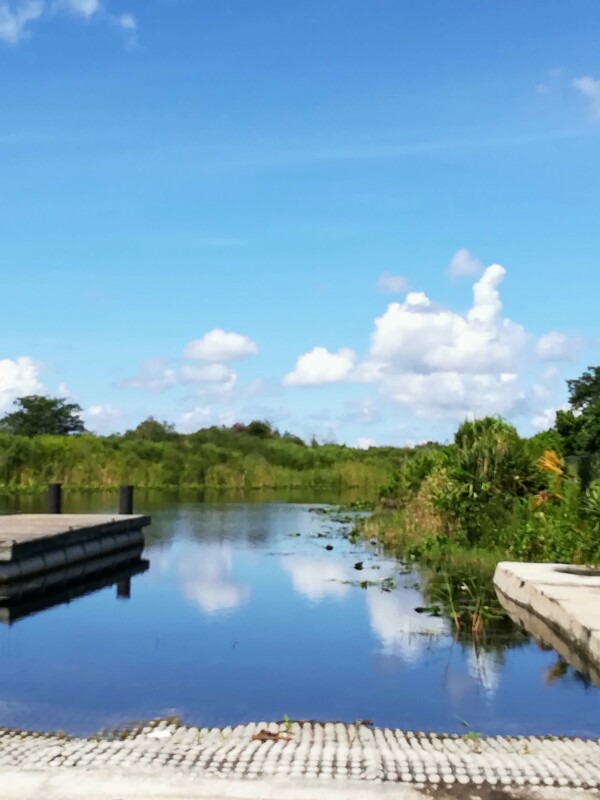 Pretty reflections in the water of the Everglades…. 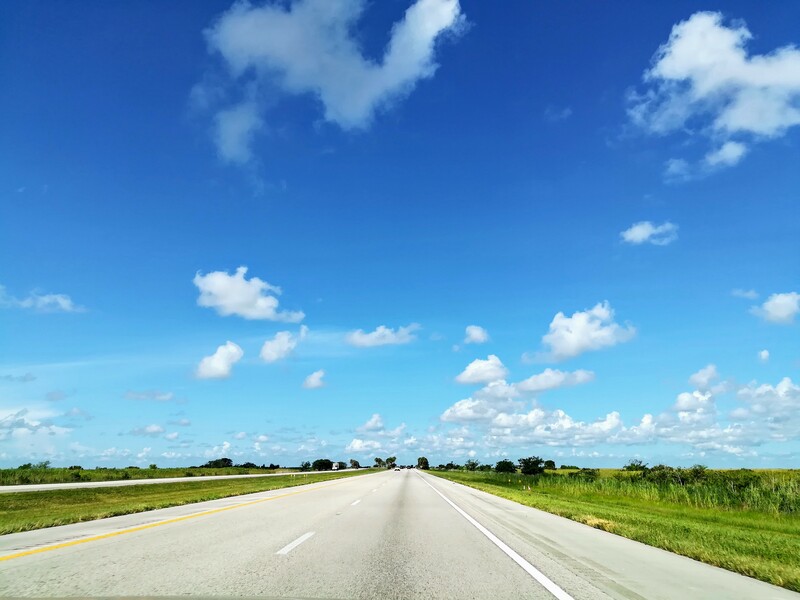 Not many on the highway…. 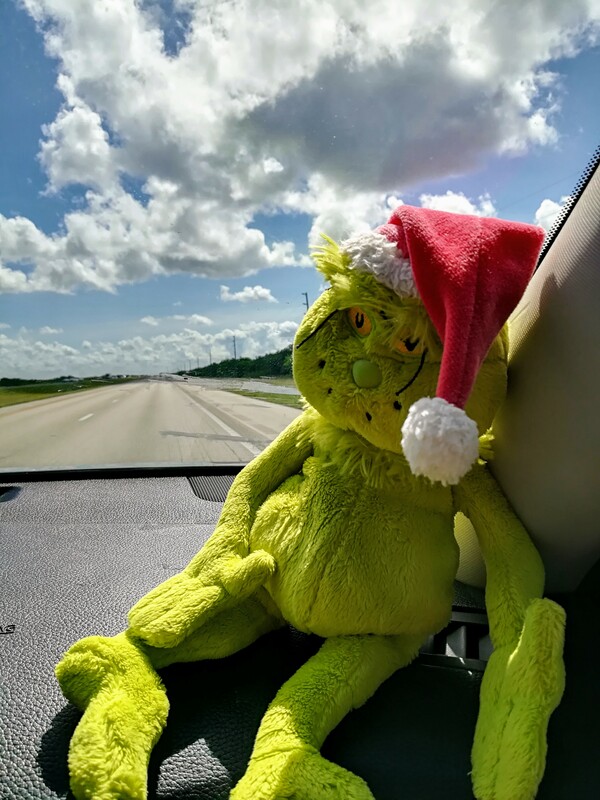 Grinch came along for the ride…..
Palm trees line the road, canals of the Everglades behind…. My thoughts and prayers to you. Take care! I’m so worried for you! When does your flight leave? Our flight is late Tuesday afternoon…. We’ve spoken to the airline, and they say that it will be on schedule. Sure wish I lived nearer. I hate to think of you going to a shelter. You’re flying out of Miami? There’s a good possibility that airport won’t even be open…. Yes, supposedly flying on Tuesday afternoon…. If I were in your shoes I’d be looking for a flight tomorrow. Even if you had to fly JetBlue to a northern US city and then home from there. JetBlue has capped all its fares at $99. I don’t think finding a flight is a possibility now. We phoned our airline a couple of days ago, and they felt our flight would go as planned. I will be sending positive vibes!!! Have you contacted your embassy??? They might have a place you can take shelter rather than going to a Dade county facility. Ahhhh, now that’s something we haven’t thought of. We do have recommendations from a law enforcement officer, here at the hotel, about which areas to avoid. It would only be a very, very last resort decision. https://polldaddy.com/js/rating/rating.jsWell I’m praying for you. And that is very much appreciated. https://polldaddy.com/js/rating/rating.jsAnd the “good” shelters will fill quickly…. There are some extra flights being added to American Airlines Miami to Dallas route for 99.00 I believe. Maybe she can return home from Dallas. Thank you for looking out for us, but I think it’s too late. 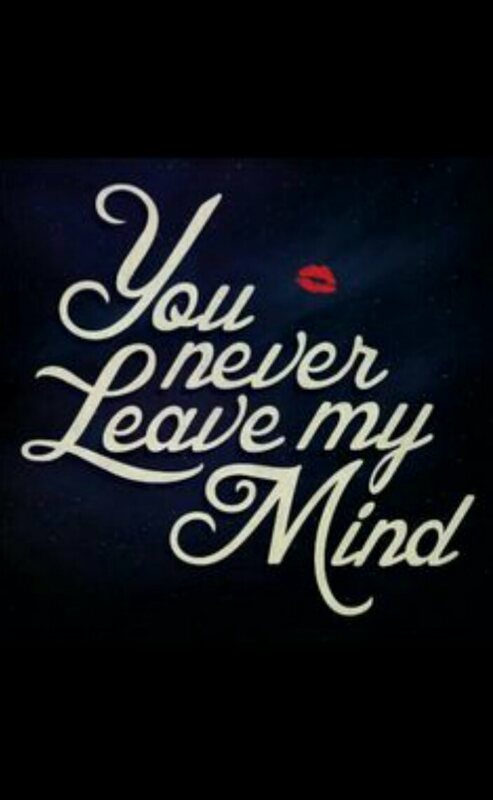 We’ll stay where we are. I’ll be anxiously waiting to hear from you after the storm. 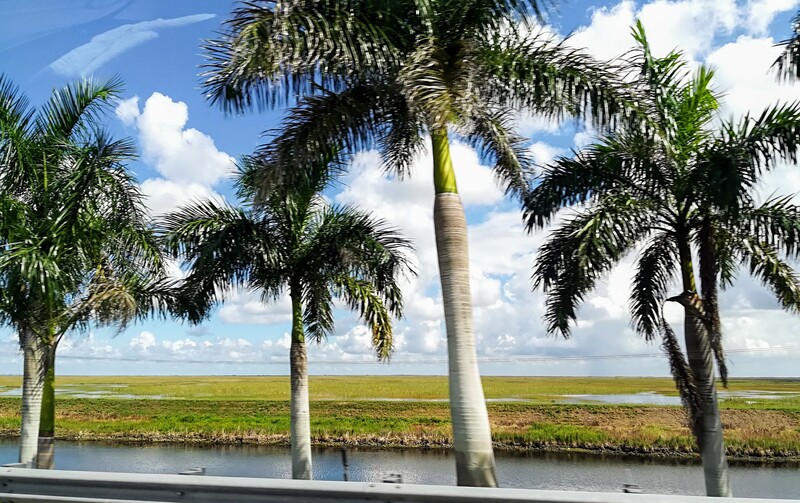 My husband suggests that you drive across alligator alley, then take highway 27 north to Tampa and then back roads up to Sebring and Tampa. I’m not sure we have enough gas in the car to embark on a long journey…. I hope you can catch your flight before the hurricane hit! I do think we’ll be going after its been through….